4 Bedroom Detached Bungalow For Sale in Tonbridge for Offers Over £850,000. This property's price has dropped from £1,100,000 to Offers Over £850,000. Little Hilden Lodge is an Edwardian detached character property with wonderful period features throughout. The spacious accommodation comprises of an entrance hallway, sitting room, kitchen with access to the garden, dining room/bedroom four, drawing room, study, three further bedrooms (two with built in wardrobes) and two bathrooms. 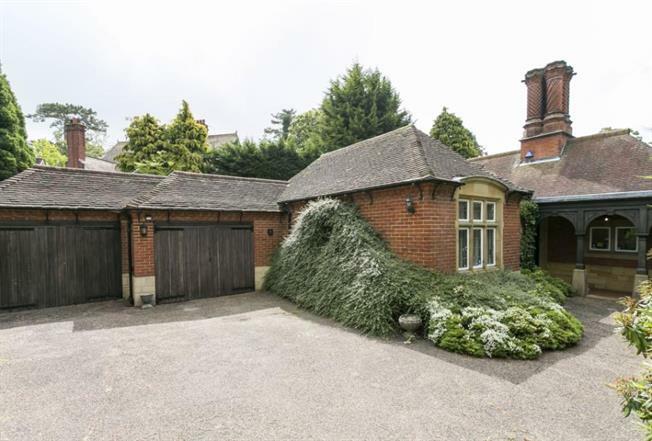 The property is approached via a private driveway providing parking and access to the attached double garage. The gardens are extensive being mainly laid to lawn with mature hedge borders, flower beds, ponds and a fantastic brick built summer house at the end of the garden with the added benefit of light, power and W.C. The additional detached double garage can be accessed from High Hilden Close and is situated mid way in the plot between the main dwelling and summer house. Little Hilden Lodge occupies an exceptionally convenient position within this sought after area on the borders between Tonbridge & Hildenborough being within easy reach of all amenities including the main line station with services to London and the South Coast and the town centre. There is a good range of private and state facilities in the area including Hilden Grange and Hilden Oaks, Tonbridge Public School as well as Judd and Hayesbrook at the Southern end of the town. Access to the A21 and thence M25 is also within striking distance to the property.